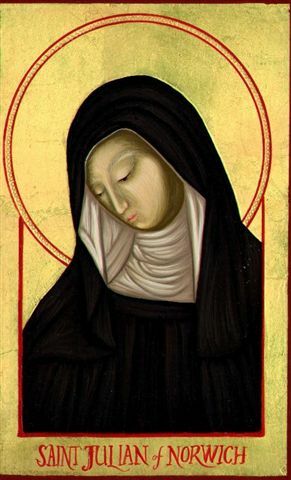 Julian of Norwich was a mystic and writer who lived in England from 1342 – 1416. She lived during the time of the Black Death when thousands were dying throughout Europe from the plague. In the midst of this death and despair Julian served as an ‘anchoress’ at the Norwich Cathedral. An ‘anchoress’ served in a cubicle often attached to the outer wall of a church. People would come to the anchoress with prayers of petitition, for advice or with words of confession. Julian’s role was to be accessable to the people and through her listening and counsel, to be a vessel of God’s grace in the midst of very dark times. Many centuries later Julian’s words continue to resonate, with wisdom rooted in the belief that God is love…and that such a Holy love is present in the midst of the fear, violence and grief that can grip our world. In Julian’s time, every village and nearly every family had lost loved ones to the plague. Yet, Julian spoke of a love that endured, that not even death could contain. Mystics are those among us who sense what we often miss….who are aware of a reality that most don’t see. In Celtic spirituality this awareness is called the ‘thin place’. Thin places are those places or people who connect us to and remind us of a deeper truth and presence that lies just behind, beneath and beyond our daily busyness and worries. Thank you Kent. You post took me back to Bill Apel’s book, Silent Conversations, chapter 6, All Will Be Well – commentary on Romans and Julian of Norwich. -In our pain, our loneliness, and our differences, sometimes I think we forget how very loved we are.